1. Seller’s Shipping Method= bysea &landto your address,usually cost 25-60 days,sometimes up to 90 days. ToRussian Federation, usually cost 20-35 days.Hope you understand. 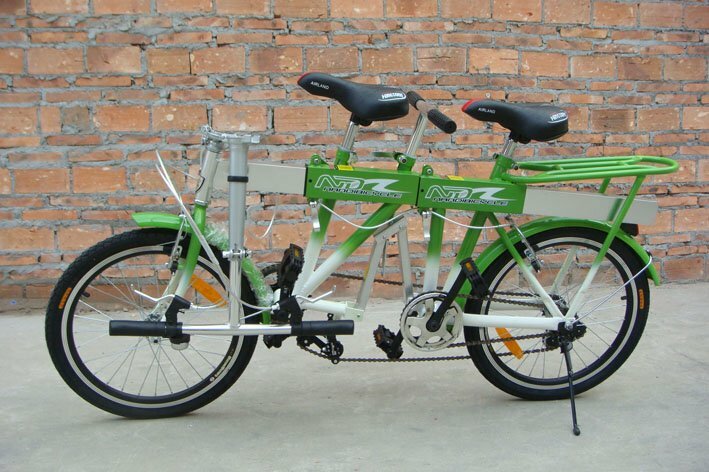 green color.telescopic folding tandem bike / built for two.foldaway bicycle as best valentines gift,high quality ! 1. Seller’s Shipping Method = by sea & land to your address,usually cost 25-60 days,sometimes up to 90 days. To Russian Federation , usually cost 20-35 days.Hope you understand. 2. China Post Air Parcel,alwaus cost 7-35 days. EMS/UPS/DHL/Fedex/TNT/Toll,usually cost 3-15 days. EU friends, for this item,if you from the countries below,when you choose Seller’s Shipping Method,you will need not pay customs tax. And you will receive the product within 7-15 days. In most time, the buyer need not pay any customs tax. We can declare it as a low value as you request to avoid it. But in some countries, the customs officers are strict. we can not pay any customs fee, Please check it out the customs policy at your own place. We accept Escrow.Currently, you can pay using Moneybookers, Visa, MasterCard and bank transfer. You can also pay with select debit cards including Maestro, Solo, Carte Bleue, PostePay, CartaSi, 4B and Euro6000. More payment options will be available on AliExpress in the future. We support shipment by "HK post" "China post" "EMS" "DHL" "UPS" "FEDEX" "TNT" "SF" , and so on.